Dodd & Co. Fencing - what are my options? Fencing - what are my options? When you buy a piece of land with the intention of keeping livestock in or wild animals, pet animals and/or other human beings out, then you will need to consider just how you are going to fence the land. The type of fencing you decide on depends upon number of factors. These can include the livestock you intend to keep, the terrain of your land, the required lifespan of the fence and the amount you can afford. You will also need to consider installation costs. Will you do the work yourself? If so what materials and tools will you need? Will you bring in a contractor – if so, what level of workmanship are you looking for? 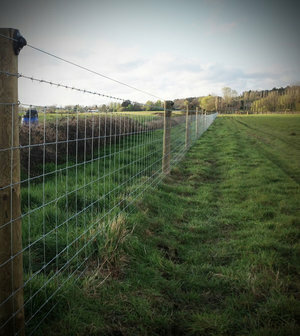 Barbed wire is a cost-effective way to fence a field if your primary aim is to keep livestock, such as cattle, sheep and goats in. The wire – three or four horizontal strands – are attached to upright posts, with straining posts set at regular distances to keep the tension high in the fence. The upright wooden posts are spaced about 12-16ft apart and the horizontal wire lines have 10-12 inch gaps between them. The downside of barbed wire is that it can look aggressive, it is dangerous for humans as the barbs can do serious damage, and it is not suitable for horses and ponies as they can easily tear themselves on the barbs. It is however, a great deterrent to cattle, who will tend to push against non-barbed wire. It is also easier to install and less expensive than many other options. The life expectancy of a well-constructed barbed-wire fence is 20 years, although posts may need replacing during that time. The smooth wire is loosely fastened to posts, which are positioned the same distance apart as those in a barbed wire system. The wire slides easily through the fastener and is tightened at the corner posts. The wire can be easily pretensioned and should be checked and tightened regularly. This type of wiring isn’t really appropriate for any animals except horse and ponies and even with these animals injuries can occur. Both cows and sheep will push through. Adding a hot wire to an existing paddock fence will act as a deterrent to animals from reaching over a fence, biting a fence or trying to escape. Whether your permanent fence is barbed wire, sheep wire or high tensile, non-electric wire, by adding an electric wire to travel along the top of the fence gives another level of security. While temporary electric fencing is effective in marking off areas for strip grazing or keeping animals to one specific area of a paddock, it is not something that can really be sued as a long-term fencing option. Yes, the animals will respect the wire but if they are chased or there is a short in the system, they will soon learn that they can push through it. Electric fences are also easily shorted - if they touch a bush or tall grasses. And as many farmers discovered in the long dry spell during April to August in 2018, a lack of moisture in the soil can lead to a loss of charge. Using a wooden top rail is a safer option for horses and humans as shown at this equine construction. For horses in particular, a post and rail system is the best choice, albeit a little more pricey than some of the other options. Typically constructed of three or four evenly spaced two-by-six-inch wood planks or four-inch round rails screwed or nailed between wood posts, wood fencing is attractive, highly visible, and safe provided it is properly installed and maintained. With its attractiveness and strength, wood makes good perimeter fencing near roadways and highly trafficked areas; however, ensure boards are nailed to the inside of the fence posts so that horses cannot pop them off by leaning on them. Also remember that boards thinner than two inches, such as one by six planks, while less expensive, are weaker and more likely to break and warp over time. Water-based paint and black asphalt or coal tar based paints are commonly used to protect wood fencing. Initial construction pricing is midrange, but maintenance costs can be high if you have animals directly on the fencing or in smaller paddock areas. Horses often chew and rub on wood fencing, damaging the fence. Boards damaged by weather, horses, or other means will need to be replaced. These are just a few of the many fencing options available. With new materials always appearing on the market, it is worth talking to an expert who can give you advice on the best fencing spouting to match your requirements and budget. Call Jamie on 07766 815830 for further information about the services offered by Dodd & Co.